This is the ideal barbecue sauce, a pungent mix of parsley, onion and garlic, with olive oil and lemon juice. On the Argentinian pampas, the gauchos eat it with an asado: meat (typically a whole bullock) roasted over an open fire. Put all the ingredients into a screw-top jar, cover, and shake together well. Leave to infuse in the fridge overnight. 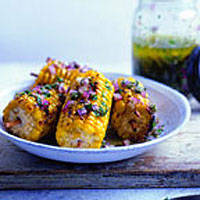 This is perfect with a crown roast of lamb or with anything from the barbecue; I love it with roasted sweetcorn. It also makes a lovely dip for asparagus or any plain-cooked vegetables and is sublime on new potatoes. New Zealand Pinot Gris has a zippy acidity that would be perfect here, but also a residual sweetness that will chime in with the sweetcorn.